Temple E is located to the west of the Forum, on a ridge above the temples of the West terrace. Pieces of the superstructure from one of its later phases have been set upon what remains of the podium and are visible today just to the west of the site museum. Prior to the Roman period, several wells and cisterns occupied the area where Temple E stands. Pottery dating to the last quarter of the seventh century B.C. was recovered from some of these, along with pieces of terracotta sculpture dated stylistically to the end of the sixth century B.C. This sculpture may have belonged to the pediment of an archaic temple; however, so far the cisterns and wells are the only evidence of early construction. As it has been reconstructed, there were two major components of Temple E: a temple and a precinct of surrounding porticoes or stoas. At least two building phases have been identified. In its first phase, the temple consisted of a concrete and stone platform of 44 m x 23.50 m, upon which was built a poros hexastyle temple of the Doric order, possibly on a three-stepped crepidoma. No exact date has been determined for this phase; however, coin and pottery evidence suggest that it was probably erected between the reigns of the Roman emperors Augustus and Caligula. At this early phase the western extent of the precinct may have been delineated by a wall immediately behind the temple (though not bonding with it), remains of which survive to the south of and are partially covered by the podium of the later temple. 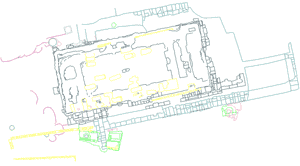 Evidence of two building phases has been seen in the east stoa (the so-called "West Shops") and on the eastern part of both the north and south stoas, whereas only a single phase can be seen in the northwest part of the complex. The original appearance of the temple in its precinct would have been a temple against a back wall with three stoas surrounding it, and it would have looked something like the temple of Mars Ultor did within the Forum of Augustus at Rome. The second temple has been restored as hexastyle and peripteral with twelve columns, carrying Corinthian capitals, on the long sides, and with a long narrow cella of approximately 24.5 meters east-west and 10 meters north-south, having a shallow pronaos with two columns in antis. It is estimated that the original column height would have been about nine meters. This podium consisted of a solid core of opus incertum with a stone casing, the remains of which are preserved to a height of 3.38 meters from the lower foundations to the top of the concrete. It should be noted that this temple is longer and narrower than the first one, and extends ten meters to the west of its predecessor. The temple at this phase was surrounded completely by the stoas. This later temple may have more than one building phase; a Domitianic coin gives a date after the earthquake of the 70's A.D. for a likely rebuilding. In addition, however, sculpture of Pentelic marble which may belong to the pediment of the temple belongs stylistically to a later period. Perhaps this is an indication of later renovations. The precinct contained an area fairly large in proportion to the forum as a whole; its reconstructed dimensions in the later period are 125 x 85 meters. In addition, the foundations of the podium are approximately nine meters in elevation above the forum and about a meter above the foundations for the archaic temple. Temple E clearly held an important place in the city of Corinth. As its name suggests, the deity for whom Temple E was built has not been securely identified. Two main suggestions have come to the fore, both of which rely in part on the description of Pausanias. The first is that it was a temple to Octavia, the sister of Augustus; the second is that it was a Capitolium temple. Neither has been proven without a doubt. Building summary written by Maura Cleffi. Anderson, J.K. "Temple E Northwest, Preliminary Report, 1965." Hesperia 36 (1967). Roux, G. Pausanias en Corinthie. Paris, 1958, 112-116; 126-7. Stillwell, R., R.L. Scranton, S.E. Freeman. Corinth I, ii; Architecture. Cambridge, 1941. Walbank, M. "Pausanias, Octavia, and Temple E at Corinth." BSA 84 (1989) 361-94. Williams, C.K., II. "A Re-evaluation of Temple E and the West End of the Forum at Corinth." In S. Walker and A. Cameron, eds. The Greek Renaissance in the Roman Empire. Institute of Classical Studies, University of London Bulletin, Supplement 55 (1989), 156-162. Williams, C.K., II. "The Refounding of Corinth: some Roman Religious Attitudes." In S. Macready and F. H. Thompson eds. Roman Architecture in the Greek World. The Society of Antiquaries of London Occasion Papers (New Series) 10, (1987) 26-37. Williams, C.K., "Corinth 1983. The Route to Sikyon." Hesperia 53 (1984) 101-104.